It was the biggest, most hyped ‘warehouse’ gig of the year. Vague Facebook banners created an allure of a V underground, V edgy night of much more than just techno/ house but an event of epic proportions. With lighting designers, an international line up and promoters from Move, Outer Body and Polyrhythmic joining forces, the bar was set relatively high. Was that bar met? …Read on. Arriving at Gloucester Park at dusk was a nice change. The sun was setting over the Matagarup Bridge that glowed a proud rainbow hue. It was a nice mild-weathered Perth setting and gave us the chance to breathe in the air when flitting from stage to stage. 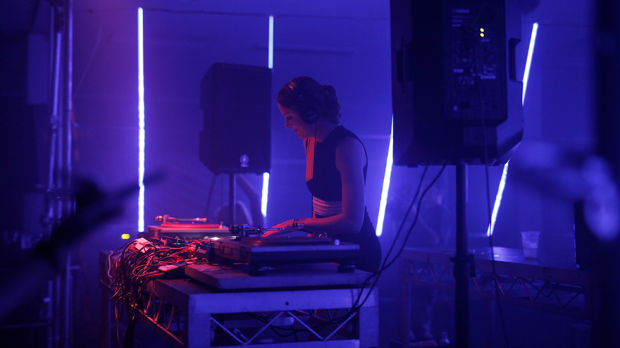 Upstairs on the Z Axis, Roza Terenzi was throwing out some deep intergalactical house, sending out her signal far and wide as she gathered a few good aliens to smile and get those muscles warmed up. And although I was vibing the music hard I couldn’t help but notice how basic this neon light beams were – if they wanted to make it immersive then why wasn’t it set out that we were dancing within the light tunnel and not just set as DJ booth display? The X Axis had a barbed wire fence and then not a lot more. I was expecting gridded lasers or something minimalist which could have blown my mind but unfortunately I was mediocrely satiated. On the lower level in the X Axis the music was feeling a lot more, as my friend put it, ‘Gesaffelstein’. The beat was thick with the air of South London. Although the room was smaller than people originally thought upon entering, it was a nice intimate space for people to get heavy with. Across on the Y Axis, there was some deep tech going and although it appeared to be one of the main stages it just felt a bit too empty, a bit too open for it to feel intimate or sweaty like most other rave style events. With Jayda G following up we got some groove disco house vibes out that created some nice disparity against the heavier stages. 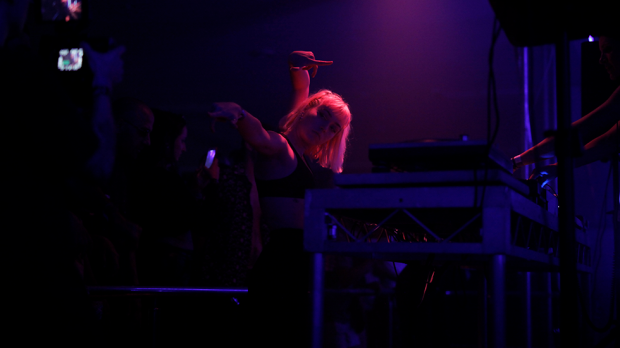 It was after this point that it was just techno full ON, at both indoor stages – there was no escaping it. There was a sense of time feverishly running out as it started to hit BPMs in the mid-130s, indoors and a colourful hypnotism to Peter Van Hoeson’s set, and it could have been this intensity that left me with the aftertaste of “DAMN, that was really bloody hectic”. The contemporary dancers on the upper level for both Van Hoeson and Claire Morgan was a nice Berlin-esque touch that helped transcend the music into a more visual experience, but again some sort of podium or staging could have definitely utilised this feature tenfold. So although there were a few things left to be desired and definite room for improvement they delivered on the basis of artists and a fresh setting. Would attend again.